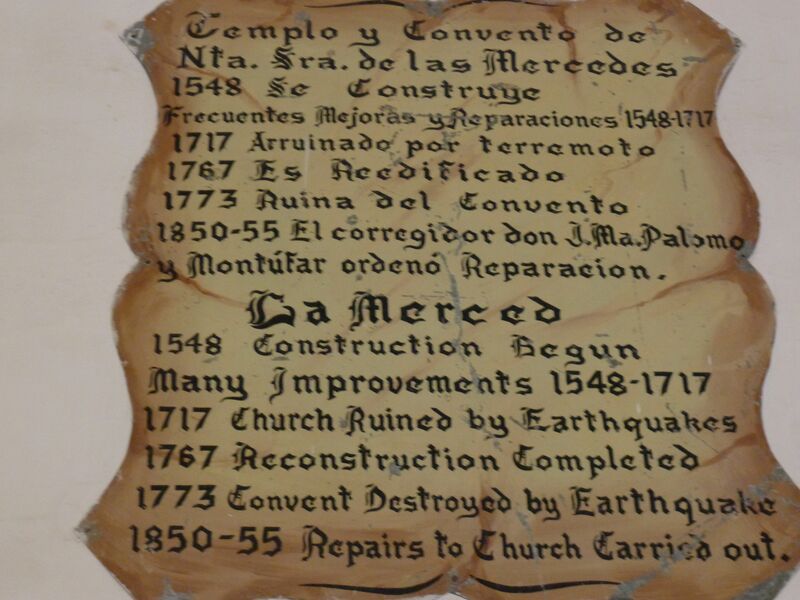 As I mentioned in my earlier post “Antigua’s Magnificent Le Merced“, the ruins behind this spectacular church, which resulted from a series of dramatic earthquakes over the centuries, are perhaps as equally impressive as the golden yellow exterior of La Merced herself. It is a tough call however I have to say that there is something haunting and exciting about ruins. I love them. I’ve seen the fabulous ruins of Rome, spent four days hiking to the Incan ruins of Machu Picchu, and took an overnight dilapidated Greek ship on my honeymoon (while sleeping on the stinky floor underneath the luggage holder) just to catch a glimpse of the Turkish ruins of Ephesus. Let’s just say, I really like ruins and there are many more that I desire to see. (Only problem of course is time. Most ruins are in far off destinations that make it hard for me to see at this point in my life). 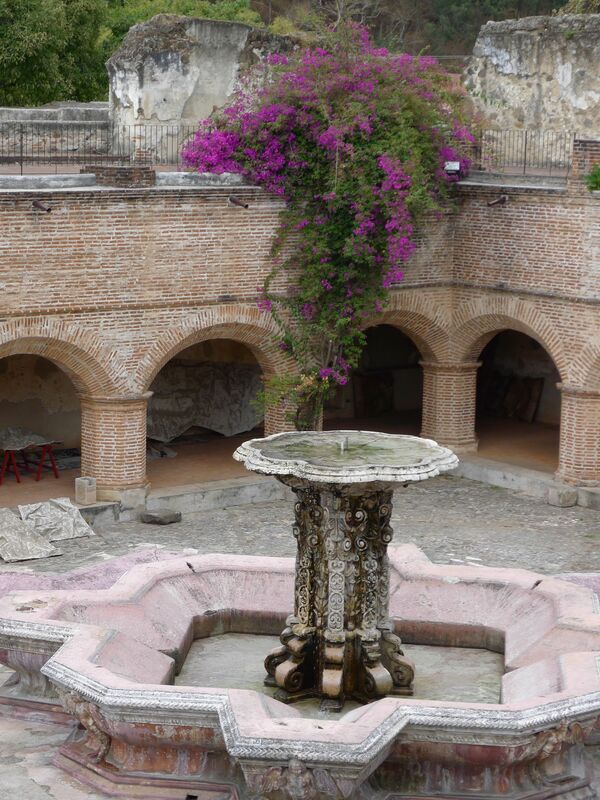 At least I was able to get my fix of ruins in Antigua! 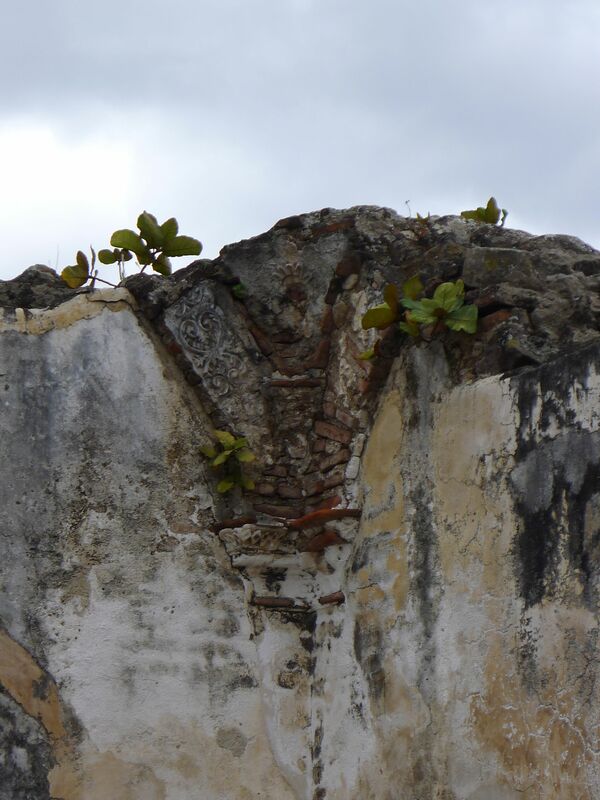 Antigua is loaded with ruins thanks (or no thanks) to all the earthquakes. 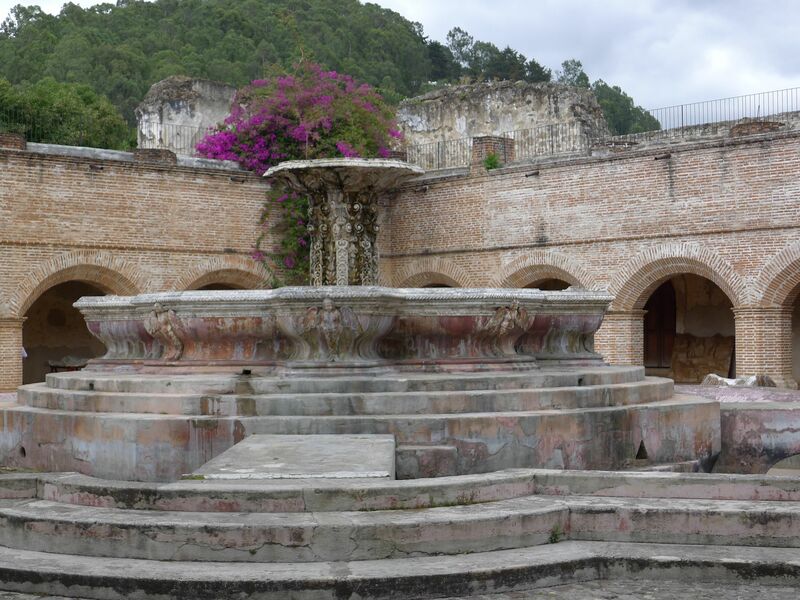 The monastery ruins behind La Merced proved to be quite impressive with its centerpiece being a 27-meter in diameter fountain which is believed to be the largest fountain in Central America. Looking down on the fountain, you can see how huge it truly is when you compare its size with the men standing around it. It is quite impressive indeed! I can only imagine how spectacular it was when it was in use with water pouring through its veins. 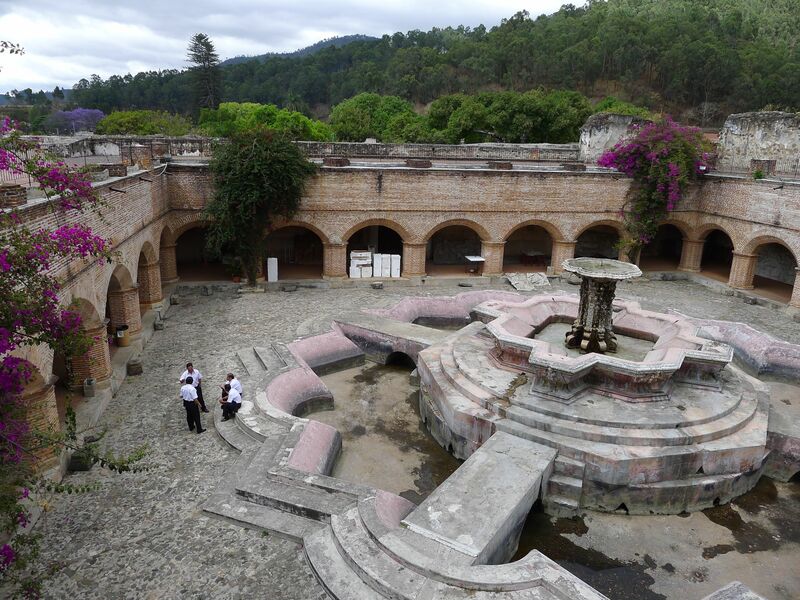 The shape of the fountain resembles a water lily which symbolizes power for the Mayan lords. It is also adorned with lily and mermaid motifs which can be seen in the photo above. As Lucy and I climbed the stairs of the ruins to get a better view of Antigua and her lush countryside, we were in for a pleasant surprise. A lovely couple were having a photo shoot for their upcoming nuptials. I couldn’t think of a better place to get my wedding pictures taken. Simply breathtaking! 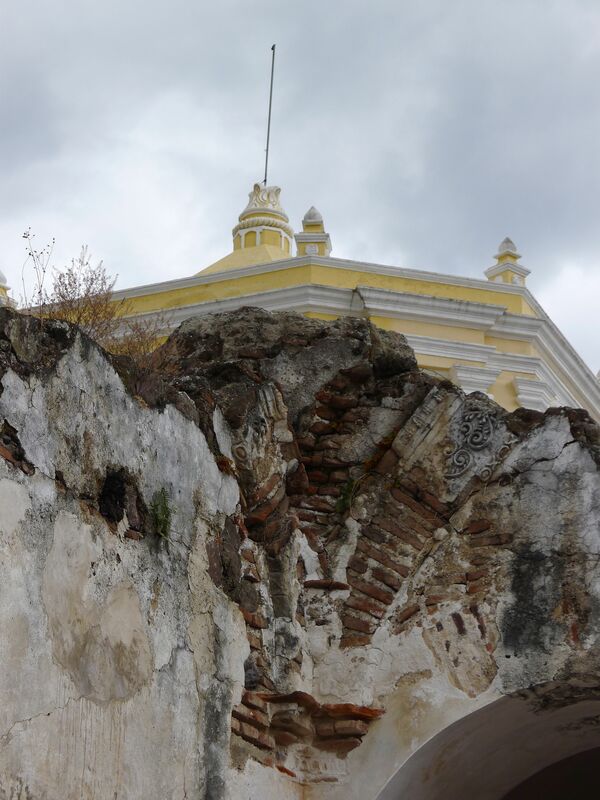 The stunning yellow and white tower of La Merced could be seen raising above…. While new signs of life were growing towards the sky…. 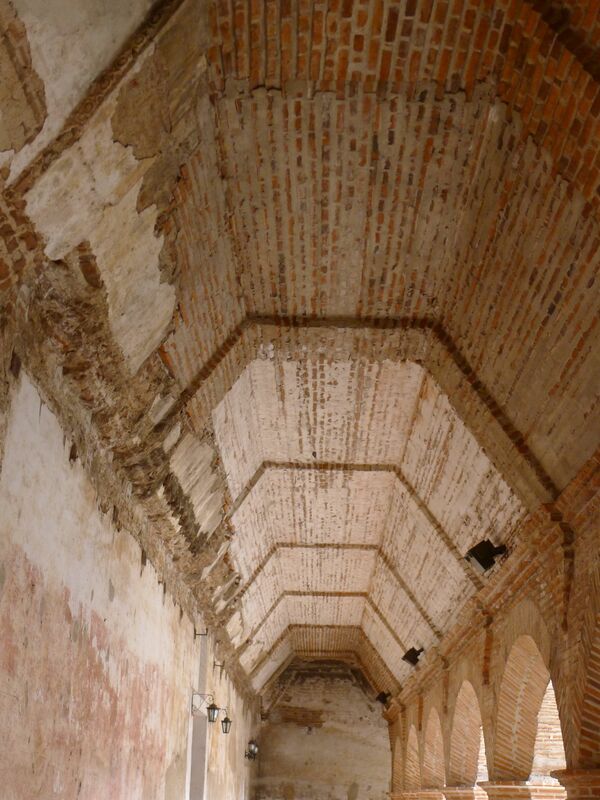 The arches and archways inside the ruins were lovely too. 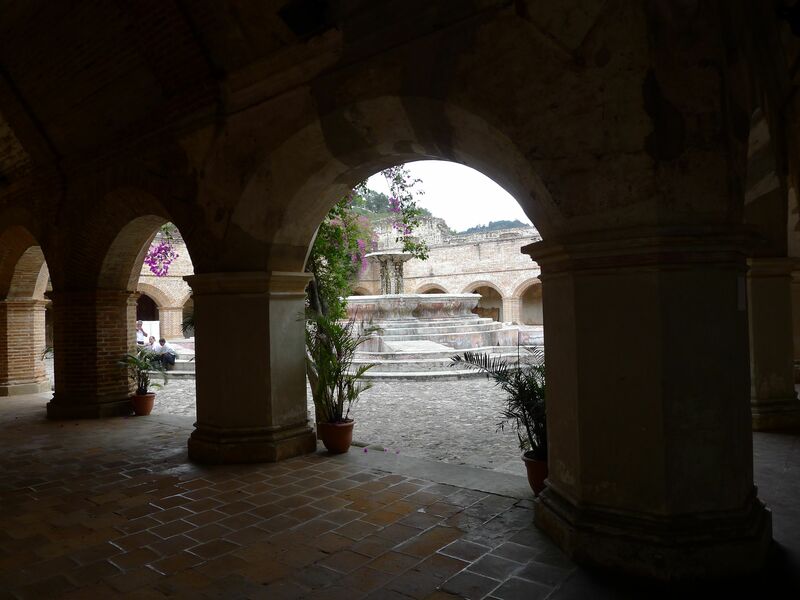 Once we filled our appetites for the monastery ruins and took a ton of pictures, we left La Merced and had yet another wonderful surprise….the brightly colored “gigantes” or “giants”. 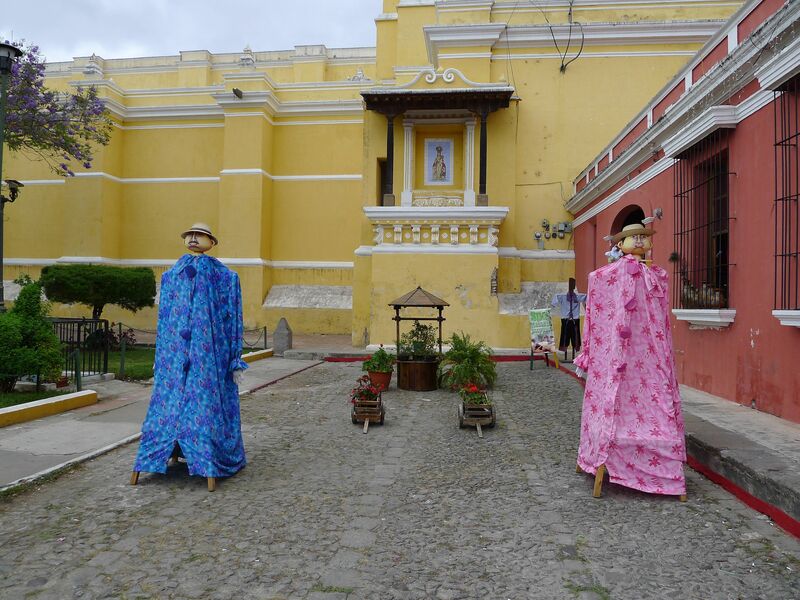 I saw my first colorful, festive gigantes in Antigua standing calmly in the sun outside of La Merced. Their gorgeous colors reflected the brilliantly, colorful time of year, Semana Santa. 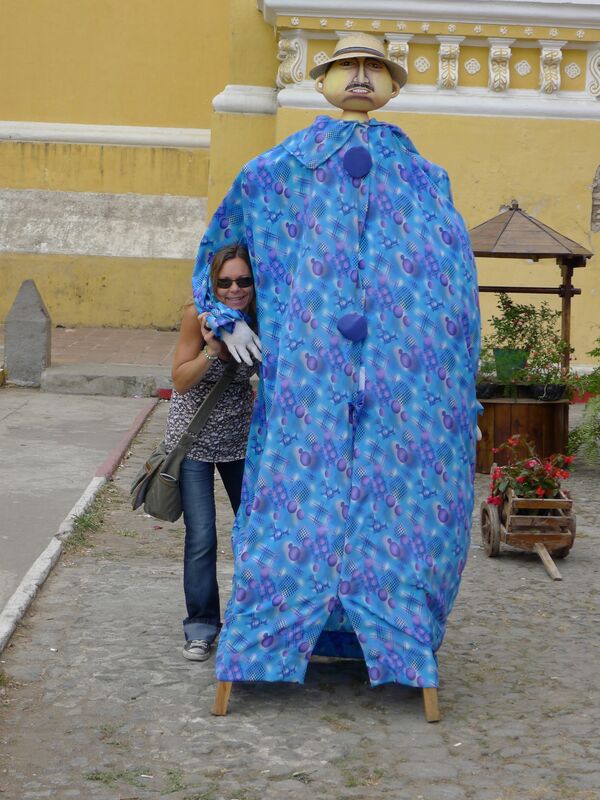 Gigantes are used throughout Guatemala during festivals and celebrations and the tradition dates back to the Spanish. Above is a photo of Lucy with a blue Gigante. 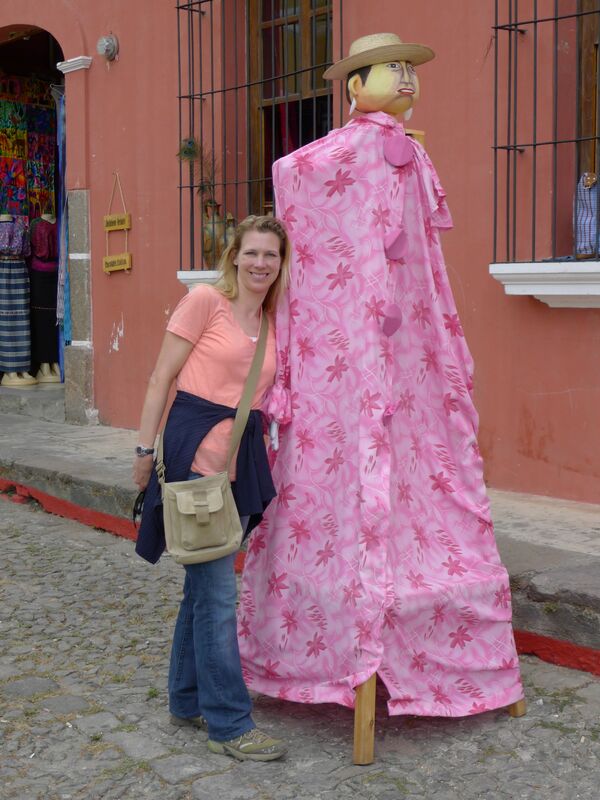 Here is a picture of me with my pink gigante. I thought I’d leave my favorite picture of last. 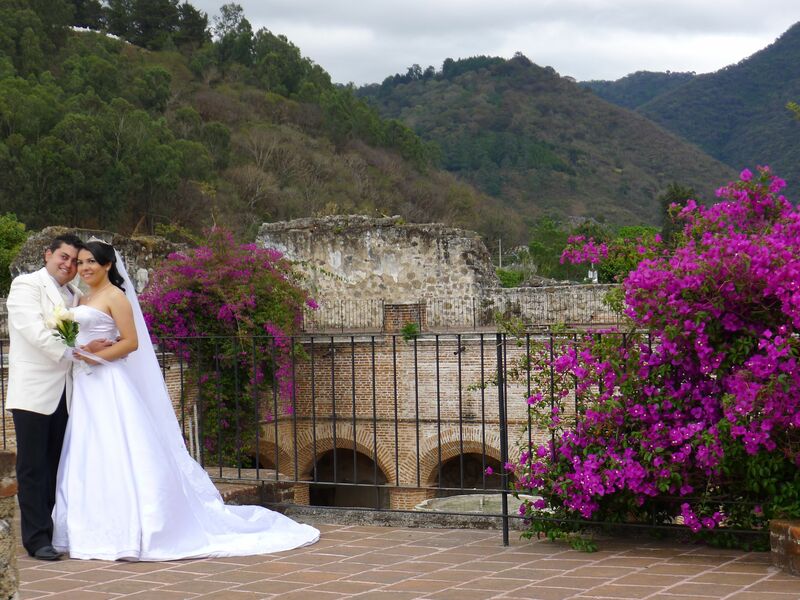 The two gigantes in front of the gorgeously colored La Merced. 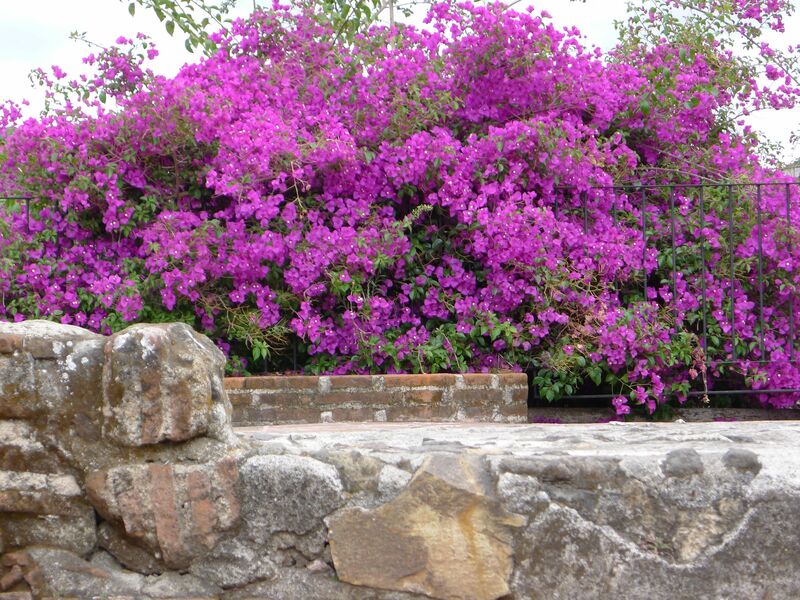 I bet Antigua is even colorful and bright on a rainy day! 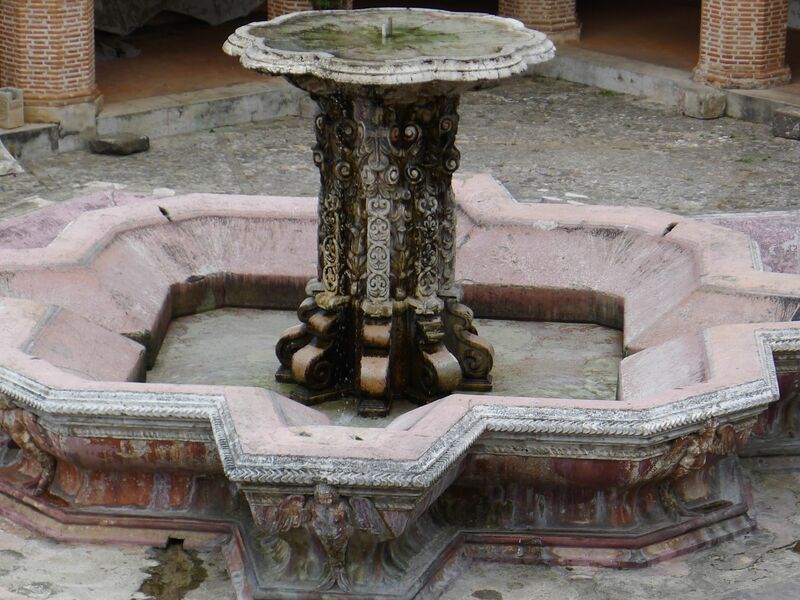 The fountain is lovely. 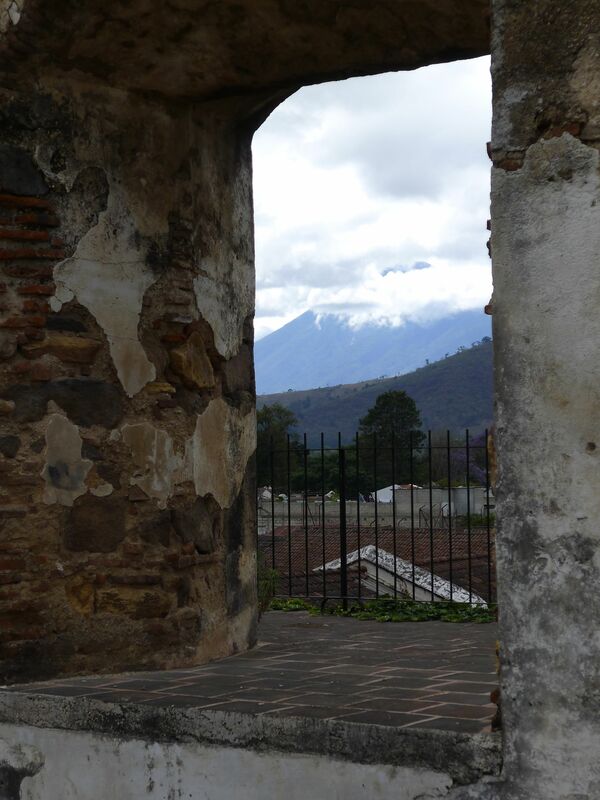 But even though you say the photo of the volcano taken through the ruin window could have been better, it’s still my favorite in this post. Thanks Kathy! Hope you are having a nice weekend too! Probably quiet for you after the big wedding weekend! Loved this post Nicole! Again, memories of that day came flooding back. Thanks for taking the photo of me with the gigante! Fun pic! It always amazed me that these places survive for so long. We have just been investigating the Nuraghe in Sardinia. The structures are from the Bronze and Iron age……incredible! That fountain is indeed spectacular! Loving your posts Nicole! No worries! I was about to send you an email as I was wondering where you’ve been but figured you were busy with work. Glad you’re back and can’t wait to catch up on your posts! Hope you are well!!! !